Luke Bryan, along with CID Presents, is proud to welcome Blake Shelton and Sam Hunt for the fourth-annual Luke Bryan�s Crash My Playa. Shelton and Hunt will each headline one of the nightly concerts on the beach, with Luke Bryan giving fans two headlining performances during the all-inclusive concert vacation set for January 17-20, 2018 in Riviera Maya, Mexico. �Blake and Sam are two of the hottest artists in country music and I couldn't be any more pumped that they have agreed to come join me this year. I swear this event just gets better and better each year!� said Luke. �It�s a dream come true to go back to Mexico to join my BFF Luke for Crash My Playa. We had such a blast playing together last year that I�d come back every year if he�d let me,� said Blake Shelton. After three sold-out years in a row, limited packages remain for the fourth installment of country music�s hottest destination event. Fans can stay at the event�s host resort, the Barcel� Maya, or opt for one of several carefully selected tropical resorts and enjoy royal treatment all weekend long � all-inclusive food and drink, 24-hour concierge service, daily onsite activities, offsite adventures like deep sea fishing, zip-lining, and ATV tours, excursions including day trips to Tulum, official Luke Bryan�s Crash My Playa merchandise packages, and more. Additional artists, details about poolside performances and more exciting event updates will be revealed soon. To see highlights from 2017�s event go to http://crashmyplaya.com/cmp-2017. Packages can be secured utilizing a payment plan of two-thirds down, with the remaining balance due in two equal payments on September 16th and October 16th. 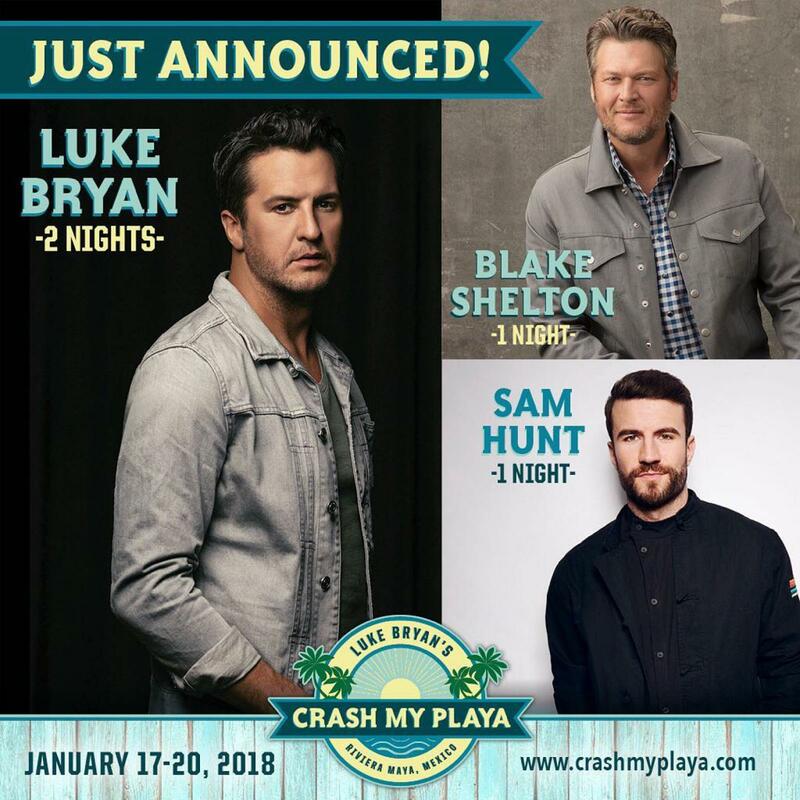 For more information about Luke Bryan�s Crash My Playa2018 and to book four or five night all-inclusive packages, please visit: www.crashmyplaya.com.